Located in the central Blue Ridge Mountains is the historical city of Asheville…Buncombe County North Carolina. Asheville is a mountain city of beauty and character, a city of culture, atmosphere, and style with a vast array of culinary delights. This city of Art-Deco architecture seems lost in time, preserved as a statement of big dreams and progress in a laid-back mountain setting. An ideal location for those who wish to visit the Blue Ridge Mountains yet want the conveniences of a large metropolitan. In a valley surrounded by mountains Asheville was a small crossroads town when pioneer planner and real estate broker John Burton founded it in 1793. Known as Morristown during its earlier years, the city was also called Buncombe until 1797, when it was incorporated and officially named Asheville in honor of North Carolina Governor Samuel Ashe of New Hanover County. At the time, Battle Square, present site of Battery Park Hotel, stood more than 100 feet above its present height and was called River Hill. The city of Asheville is located on a plateau divided by the French Broad River with and average elevation of 2165 feet. Many of the surrounding mountains are above 5000-feet with Mount Mitchell towering at nearly 7,000 feet. 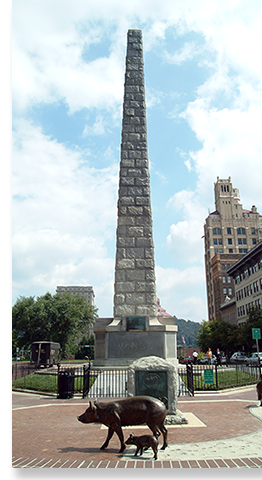 Buncombe attained county status on January 14, 1792 and was named for Revolutionary War hero Colonel Edward Buncombe. After the construction of the Buncombe Turnpike in 1827, Asheville soon became a focal point for speculators and adventurers. In 1882 the town of Asheville was expanded and made the city of Asheville. More and more visitors started to arrive in the Asheville area as soon as additional roads were built. They were drawn by the crisp mountain air, incredible vistas, and an abundance of sulfur springs along with the invigorating mountain climate and natural resources. When the railroad finally reached Asheville in 1880 it brought power and affluence with it, including a young aristocrat from New York named George Washington Vanderbilt in 1888. George Washington Vanderbilt began construction on his now-famous mansion at the 100,000 - 125,00 acre Biltmore Estate, just south of the city completing the castle style mansion in 1895. 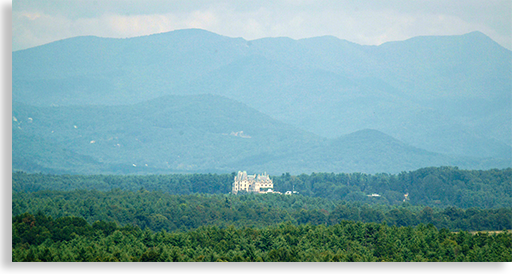 George Vanderbilt vision was instrumental in the founding of one of the first forestry schools in America in 1898, the Biltmore Forest School. Along with those great accomplishments George Vanderbilt is credited for the purchase and reconstruction of a town that was necessary to support the day-to-day operations of Biltmore Estate. In 1889, George Vanderbilt purchased the neighboring town of Best and renamed it Biltmore Village creating a community for his estate employees. Today Biltmore Village is a quaint town of a distinctive mixture of shops, galleries and restaurants. The brick sidewalks and 19th century cottages are reminiscent of an old English village. Since the 1930’s Biltmore Estate has been opened to the public for daily tours of the Biltmore House and self-guided tours of the present-day Estate’s 7,000-acres. As per George Vanderbilt’s wishes, Edith Vanderbilt sold 87,000 acres to the federal government in 1915 establishing the core of the Pisgah Nation Forest. Asheville’s greatest boom was in the 1920’s with developments that included the Jackson Building, City Building, Buncombe County Courthouse, Grove Arcade, Battery Park Hotel, Flat Iron Building, and the Bon Marche Building. More Art Deco architecture was constructed in the late 1920’s and early 1930’s in downtown Asheville than in any other city in the southeast apart from Miami Beach, Florida. 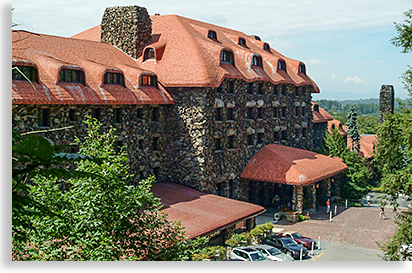 Asheville soon became a popular health resort and vacation retreat, attracting the wealthy, dignitaries and many celebrities. Grand hotels such as the Battery Park and Grove Park Inn were built to accommodate the many guest, Asheville quickly became a swirling social center for such urban and sophisticated travelers such as F. Scott Fitzgerald who frequented the Grove Park Inn’s room 44. Franklin and Eleanor Roosevelt took many vacations at the Grove Park Inn along with inventor Thomas Edison to name a few. Asheville was flying high and it was a time when outsiders had come to appreciate the handicrafts and folk art of the native mountain people. The popular Southern Highland Craft Guild was formed here in 1928 to preserve those traditions. 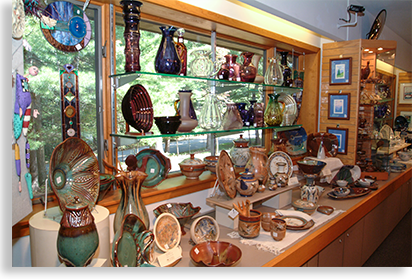 The Southern Highland Craft Guild is in the Folk-Art Center; you can find directional signs on the Blue Ridge Parkway. Asheville’s “Urban Trail,” tells a tale in works of art in a gallery set under the open sky. 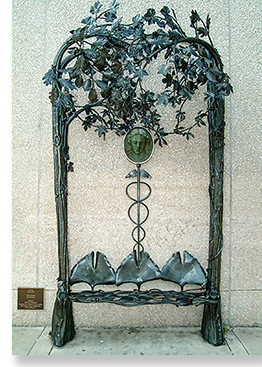 This unique expression of historical achievements tells the story of the city of Asheville along with its renowned citizens through an intriguing array of public artworks created by area artists. It covers nearly a 2-mile loop in downtown Asheville with marked art stations and information about its historic architecture. You can take a guided tour or use a map available at the Chamber of Commerce. It’s a pleasant stroll, highlighted by the city's natural beauty. 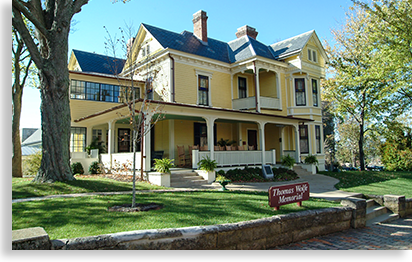 Audiotapes guides are available at the Asheville Art Museum and Thomas Wolfe Museum. After the American Revolutionary War, mainly Scotch-Irish immigrants from Northern Ireland settled Asheville. Bele Chere is North Carolina's largest street festival. This popular Asheville festival lasts for 3 days and is held in the city’s downtown area, with a celebration of music, food, crafts and more. Each August, Asheville celebrates its Appalachian Heritage at the Mountain Dance and Folk Festival – the oldest festival of its kind in the nation. Another Asheville attraction is the North Carolina Arboretum, boasting more than 100 Bonsai plants in their collection. Mr. and Mrs. George Staples of Butner donated the arboretum’s original bonsai in 1992 from their private collection. The collection now includes many plants native to western North Carolina. All of the trees are either donated or grown at the arboretum. If it's outdoor adventure your looking for, the Asheville region has what you are looking for. 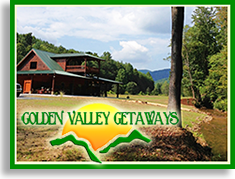 Local outdoor activities such as hiking on the Appalachian Trail, rock hunting for precious gems, fishing for trout in the clear mountain streams, white water rafting, or a cruise along the Blue Ridge Parkway. Bike Magazine named Asheville in the Top 5 mountain biking towns. Canoe and Kayak magazine named Asheville one of the top 10 paddle towns in the United States in 2001. In 2001 Whitewater Paddling magazine made Asheville a Top 10 White Water Town. You can choose a gentle float down the French Broad River, or a rollicking white water raft ride down the French Broad. Another site of interest is the Black Mountain region just east of Asheville. First settled in the 1780’s the community was originally known as Gray Eagle. The name was changed in 1870, in reference to the lofty range five miles to the north. Stroll down Main Street through the town’s lively center for crafts and shopping, and you’ll be surprised how little things have changed. You may catch a craftsman strumming a handmade dulcimer or observe artisans working right out of their stores. You can also explore the old hardware store and the 1890’s depot. The Asheville area of Buncombe County is in the heart of the Blue Ridge Mountains; from lavish accommodations to the rugged backpacking through the Blue Ridge Mountains, Asheville has exactly what you’re looking for when planning your next fun filled vacation or a new way of life.